If you expected something different from "A Good Day to Die Hard" then you probably will be left a bit disappointed. At its core, the film employs the same old formula and style that made the "Die Hard" franchise one for the books. Honestly, we aren't complaining. You see, you go to watch a "Die Hard" film because it is just damn fun to watch and put simply, "A Good Day to Die Hard" never strays away from its brooding. The film is - literally speaking - one heck of an action-packed, mind-blowing ninety seven minute experience. 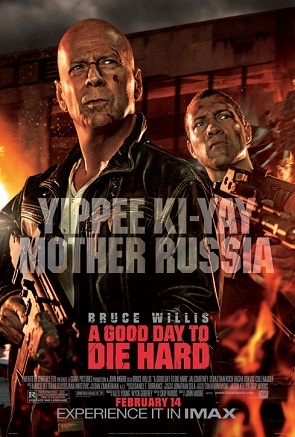 When John McClane's estranged son Jack McClane (Jai Courtney) is arrested for the assassination of a subordinate of a corrupt Russian high-ranking official named Chagarin, John McClane decides to go to Russia to save his son from ruins. As John arrives at his son's trial, a bomb goes off and Jack with his rogue Russian leader, Yuri Komarov (Sebastian Koch), tries to escape from whomever planned the whole bombing. With the help of John they eventually do and John finds out that his son is actually an agent working for the CIA. His agenda is to extract Komarov and get a certain file that will incriminate Chagarin and prevent a very dangerous man from getting the highest position in Russia. Soon, father and son McClane meet and must work together to keep each other alive and keep the world safe. "A Good Day to Die Hard" had us completely enamored not by its plot or by its main cast but mostly with its elaborate set pieces that are just totally unbelievable in its magnitude. The car chase alone was jaw-dropping with cars upon cars being crashed, exploded, tossed and flown to anywhere and everywhere and that is just the tip of the iceberg as the film never backs down on the action. Characters spend only a few minutes conversing before another action sequence takes its place. Some may be put off with this method but this also means that the film has never a boring moment. Even the short times that characters do converse are also filled with one-liners (mostly from John McClane) that further ups the mood. Although e do think that the film lacks the usual oomph we get from John McClane on this area. As for the plot, it was ordinary really but we were also surprised with its eventual twist. We also wished that the film was longer as it came out a little bit short. Overall, "A Good Day to Die Hard" employs the same old tricks that its predecessors did. John McClane (and now with son) do unbelievable stuff on the big screen with almost nary a scratch or broken bones. We cannot say that this concept is still fresh but we also cannot conclude that it's already getting old. - we actually wish it was longer! - the film employs the same old formula of not "dying hard"